So what do Shirley Temple, President Franklin D. Roosevelt and Walt Disney have in common? Nothing. Haha, just kidding, they have all had roles strongly supporting National Wildlife Week! For those of you who haven’t marked it on your calendar yet it’s April 19 – 27. The skinny on this cool and fun tradition is that it’s been around for 70 years and, while the themes have covered everything from clean water to endangered species protection, the purpose remains true: “uniting the efforts of all friends of outdoor America to the end that future generations shall have their rightful heritage of wildlife.” It’s also a great excuse to do something for your world! This year’s theme is GETTING OUTDOORS. That’s right. So immediately after learning about this event I want you to properly clothe yourself to step outside and breathe fresh air! NWF really wants to make the outdoor experience worthwhile by helping you watch and record the wildlife you see. We are helping people locate nearby parks and encouraging everyone to share their stories. Especially for those that are computer bound (me) but love the outdoors. Let me tell you, I had no idea I lived near so many trees. There are also tips and resources for individuals, groups, and communities to develop their very own service projects. Download a watch list that has flora and fauna local to you! 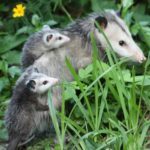 If you’re in need of a thorough wildlife resource be sure to use enature.com. After all, Jeremy has the right idea, let’s use this to prepare for (blogger and regular) bioblitz :). To sum it all up, make sure you spend a significant amount of time outside next week and you won’t regret it! If you see an animal, try to remember it and share it with us. But if not, just enjoy the time getting closer to your roots…literally. The outdoors is calling, and while people like Robert Redford have celebrated this in the past, what’s most important is that you celebrate it now! If you’re interested in promoting it or if you link to it let me know and I’ll add you on here!